Tiger Woods. Photo / AP. Woods delivered the perfect ending to his amazing return from four back surgeries today with a performance that felt like old times. He left the competition feeling hopeless as he built a five-shot lead early and hung on to win the Tour Championship. "[At the] Beginning of the year that certainly seemed a tall order but as the year progressed, I proved that I could play. I found a swing and put some pieces together and I knew I could do it again." 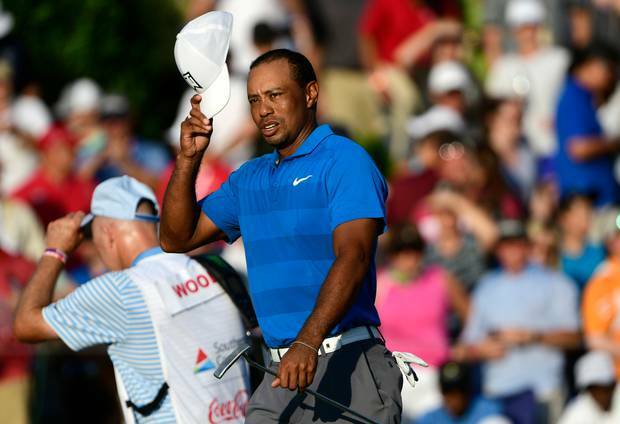 Woods admitted it was an emotional final round as the crowds swelled to sizes never seen before on the PGA Tour. "I had a hard time not crying coming up the last hole," Woods added. Before saying once he got on the 18th green he knew the title was his. England's Justin Rose finished in a share of fourth place which was enough to claim the Fed Ex Cup title and the US$10m bonus, denying Woods the massive pay day with a birdie on the last hole. "I can't believe I pulled this off, what the season has gone through. It's been tough. Not so easy couple of years. I couldn't have done it without the help of everyone around me," Woods added at the trophy presentation. "Some of the players I saw after the 18th green knew what I struggled with...it's hard to believe I won the Tour Championship. Woods is three shots ahead and one round away from capping his comeback season with a moment that has defined his career. Woods played the most dynamic golf he has all year yesterday with six birdies in his opening seven holes to build a five-shot lead. He cooled from there with a few mistakes and had to settle for a 5-under 65 and a three-shot lead over Rory McIlroy and Justin Rose in the Tour Championship.